Monsters stalk the woods. Angry ghosts and spiteful witches plague the villagers. Explorers search for lost cities and fabled treasures. Ancient evils are awakened. There is a secret history, and this history deals with events that took place in the shadows. These events played a role in the history of the American colonies and the revolution that few know about. The truth is hidden, and plots are afoot. Events are moving behind the scenes, and agents lurking in the shadows are agents with their own agenda. War is coming. The Siege of Boston is lifted, and General Washington is leading the Continental Army to New York. The enemies are many, but as to who they are, you do not know. 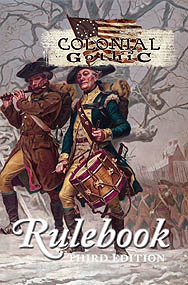 Revised, rewritten and redesigned Colonial Gothic 3rd Edition provides players and Gamemasters what they need to run adventures during the American Revolution. Everything you need to run a historical supernatural horror game is found in this book: rules covering the use of magic and alchemy, in-depth information on the life and times of the colonies, a bestiary of monsters pulled straight from the period; the possibilities are endless. Using a fast and simple mechanic, setting up and running a game of Colonial Gothic has never been easier. Plus, the 3rd Edition Rulebook is fully compatible with all previous Colonial Gothic adventures and sourcebooks.